A leading resident of a refugee camp in the West Bank city of Nablus put it very succinctly. There was a conspiracy, he said, to run down the UN agency responsible for the welfare of Palestinian refugees. President Trump has already announced he is ending the $365 million US contribution to the UN Relief and Works Agency and USAID budget of $200 million for Palestine. Middle East minister Alistair Burt responded with a £7 million increase in the UK contribution, but, as Labour’s shadow Middle East minister Fabian Hamilton pointed out, that would still leave UNRWA with a shortfall of $380 million this year. It was “a drop in the ocean”. The chairman of the residents’ committee of the Al Askar camp, Husni Odeh, told a group from Sheffield last week that the UN agency was already being forced to run down vital services for the most marginalised refugees suffering from high levels of poverty and unemployment. Class sizes in United Nations schools have been increased to 50 or even 55. UN health centres often have just one doctor to see 50-60 patients – and they have no medicines to give them. When inevitably some refugees see no point in going to a doctor that has no medicine, or move their children out of overcrowded UN schools, they claim the Palestinians “don’t want our services” in order to justify still further cuts in UNRWA’s budget. “The UN are closing health centres and they are shrinking their services gradually so that people don’t stop them,” he said. President Trump has also floated the idea of downgrading Palestinian refugees so that the next generation will no longer have refugee status. But there is an essential difference between Palestinian refugees and refuges from natural disasters or wars. The latter will eventually return to an empty home or at least a plot of land where they can rebuild their lives. But Palestinian refugees have no home to go to. Even in their own country they are refugees. Their villages have been demolished. Their homes are occupied by strangers. The aid that western countries provide for Palestinian refugees is essentially conscience money to atone for the fact that they are not prepared to pressure the Israeli government into the action they know is needed. UNRWA provides assistance for 5.15 million refugees, education for 515,000 children, health centres for 3.1 million patients and basic food rations for 255,000 refugees living in extreme poverty. President Trump is openly trying to starve Palestinians to the negotiating table to accept a deal has not yet been published, but which will undoubtedly involve a complete humiliation and the loss of yet more land in addition to the 78% of historic Palestine they have already given up their claim to. Labour has called for an international emergency conference so that other countries can pledge support to close the funding gap caused by the withdrawal of the US contribution. They will have a choice between increased aid to avert a humanitarian crisis – or action to put effective international pressure on Israel to lift the blockade and the occupation. A new critique of the IHRA code of conduct, now incorporated into the Labour Party’s disciplinary code, has been published by European Jews for a Just Peace, a federation of 11 European Jewish peace including the UK’s Jews for Justice for Palestinians. It argues that the assurance in the introduction to the code that “criticism of Israel similar to that levelled against any other country cannot be regarded as antisemitic” is impossibly ambiguous. “Does it mean that anyone criticising Israel can be regarded as antisemitic unless he or she has also criticized other countries in the same way? Even worse, does it mean that the person can be regarded as antisemitic unless he or she criticises other countries in the same way at the same time? Either way, it would discourage people from exercising their right to criticise Israel. “What does ‘similar’ mean in this context? What other countries have been belligerently occupying another people’s land, illegally settling it and taking its natural resources, creating an apartheid-like system of unequal rights, and using violent and sometimes lethal means to repress resistance, for 50+ years? “The sentence also creates an internal contradiction in the document. It contradicts the immediately preceding sentence in the preamble and the last bullet point in “contemporary examples of antisemitism”. If Jews are not collectively responsible for the actions of Israel (as surely they are not), then how can it be antisemitic to single out Israel, whether the criticism is well or ill founded ? “There are of course many other countries that abuse the human rights of their own citizens, and they are regularly criticised. However, no one is required to choose between concerning himself with all cases of abuse or none. That would be a limitation on freedom of speech. The two members of the British Board of Deputies who accused their vice-chair of anti-semitism were themselves the target of a censure motion from the Board’s leadership for what was called a “spectacular own goal”. Jacob Lyons and Martin Rankoff collected signatures for a motion of no confidence in Dr Sheila Gewolb after she issued a press release criticising Israel’s Nation State Law. The press release was issued by Dr Gewolb in July in the name of the Board and it criticised the new law – which says that only Jewish Israelis have a right to self-determination and downgrades the status of the Arabic language – as “regressive”. The two members accused her of “applying double standards to Israel” – one of the examples of antisemitism given in the IHRA code that the Board of Deputies persuaded the Labour Party to adopt in its disciplinary code. This was the example – “applying double standards – that the Board itself used to accuse the National Union of Students of antisemitism for voting to support the Boycott, Divestment and Sanctions campaign. The Board used the same example to accuse academics of antisemitism when they wrote to the Guardian to support an academic boycott in 2015. The potential for embarrassment was recognised by the Board when they issued a vote of censure against the two members for “bringing the Board into disrepute” at the same time as urging their members not to sign their vote of censure against Dr Gewolb. At a meeting of the Board in October President of the Board Marie van der Zyl issued an edict to members that they had to “welcome a huge diversity of opinion” and “learn to disagree with tolerance and respect”. Layla Moran, the Liberal Democrat MP for Oxford West, has tabled a private member’s bill to recognise the State of Palestine – though it stands little chance of being debated and even less of being passed. The draft law was presented under the Commons Standing Order 57 which goes to the back of the queue of private members’ Bills and cannot normally be debated until all the others have been voted on. That is unlikely to happen. The Bill has cross-party support from Labour, SNP, Plaid and Green MPs as well as Liberal Democrats and its sponsor, Layla Moran is the first British MP of Palestinian descent. The House of Commons voted in favour of the recognition of Palestine by 274 votes to 12 in a backbench business debate in October 2014, but despite the overwhelming majority David Cameron refused to give it Government support. The UK has been committed to recognising a state of Palestine “in principle” since 2012 when the Foreign Secretary William Hague said Palestine was “fit for statehood” and promised recognition – but “at a time of the Government’s choosing”. Foreign Office minister have stated dozens of times in the Commons that they are still committed to recognition – but are waiting for the time when it will do most to help the peace process. Over 130 of the United Nations’ 193 states already recognise Palestine and most of the countries still refusing recognition are in western Europe. The UN itself recognises Palestine as a state though not a member, its application to join having been refused as the result of a Security Council veto from the United States. 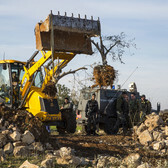 British-made JCB diggers were seen at the village of Khan al Ahmar, which has been threatened with imminent demilition for the last four months to make way for the expansion of an illegal Israel settlement. The prosecutor of the International Criminal Court has warned Israeli army generals that they could face charges if the demolition goes ahead as “extensive destruction of property without military necessity and population transfers in occupied territory” are crimes in international law. Labour MP Paula Sherriff raised this with Middle East minister Alistair Burt in September and he confirmed in his reply that demolition would almost certainly be “contrary to international humanitarian law”. “I assure you that the British Government is committed to encouraging and fostering respect for human rights among UK businesses,” he told her. Companies must “take account of” international human rights law. JCB diggers have since disappeared from Khan al Ahmar to be replaced by Volvo, Caterpillar and Chinese-built Liu Gongs, but it was not clear whether this was the result of action by the Foreign and Commonwealth Office or the company, based in Rocester, Staffs. The demolition was due in July but has been delayed – possibly as a result of international protests from the UK and other European countries but even more probably as a result of the warning from the International Criminal Court. The demolition of Khan al Ahmar will lead not only to the eviction of 193 Bedouin, including 86 children, and their school which serves five surrounding villages, but will also open the way for settlement building in the planning area E1 which stretches from Jerusalem to Jericho, cutting the northern West Bank off from the southern West Bank. Now that the mid-term elections are over, President Trump has promised to deliver his Middle East “deal of the century” within two months, ie by January 6. It’s true that no one knows exactly what it is going to say, but the drift is clear. Trump has spent the last two years undermining the three bargaining chips that the Palestinians still had. For the last 70 years the international community – including the US – has funded the UN agency that houses, educates and where necessary feeds the Palestinian refugees forced to flee in 1948 and never allowed to return. For the last 51 years the entire international community – again including the US – insisted that Jerusalem could only be the capital of TWO states and they kept their embassies in Tel Aviv until that was agreed. For the last 28 years every President from the late George Bush Snr onwards has red-lined the building of settlements in the desert between Jerusalem and Jericho, the so-called E1 planning area. By cutting off funds to UNRWA, moving his embassy to Jerusalem and turning a blind eye to new settlements and the demolition of Khan al Ahmar, Trump has removed any reason for the Israelis to negotiate. They already have what they want. Why would they negotiate? The Palestinians made their historic compromise in the Oslo accords in 1993 when they recognised the State of Israel on 78% of historic Palestine even though they are now more than 50% of the population. It is unreasonable and unrealistic to expect them to cede any more land or make any more concessions. The next chapter in this saga can already be written. President Trump will publish his “deal of the century”. It will be rejected by the Palestinians, by the Arab states, by all the mainly Muslim states and by the great majority of the United Nations. The chapter after that is more difficult to predict. UK policy is totally at odds with US policy over all these issues – Jerusalem, refugees, settlements. Will the UK stand up for what it believes, for what the UN believes, or will it engage in fudge? That is up to the members of the UK parliament. You have the power and you may be called upon to exercise that power in the next few months. It is only the UK, France, Germany and other West European states that have the power to change the course of events. The Palestinian Authority – for all its many faults – has stood up to President Trump, refusing to speak to him or his envoys, and to Saudi prince Mohammed bin Salman, who has tried to forge a regional alliance with the Israelis. The Palestinians have lost most of their territory and most of what little bargaining power they had, but they will not lose their dignity. As the cat-and-mouse game over the imminent demolition of the Bedouin village Khan al Ahmar shows, the Israeli government is adept at playing a waiting game. They can make small concessions or allow minor delays in order to deflect the protests of Western countries, but then as soon as the world is distracted by some other hotspot, they will move forward on their strategic path which is to annex or assimilate the majority of the West Bank and to normalise their annexation of east Jerusalem. The only way to reverse this process is to grasp one of the many levers that Western countries have to put effective pressure on Israel – by recognising Palestine, stopping trade with settlements or stopping companies from facilitating the occupation. Middle East minister Alistair Burt told the Commons at Foreign Office questions that the long-awaited Trump plan is the “only thing” that will bring a resolution to the long-standing crisis. . Asked by Labour MP Alex Cunningham about the escalation of violence on the Gaza border, the demolition of Palestinian homes and the ending of support for refugees, the Minister said “the only thing that will deal with the concerns that he raises” is the Trump plan. Jason Greenblatt has already provoked strong reactions. Israelis Justice Minister Ayelet Shaked has already called his plan a “waste of time” and Palestinian president Mahmoud Abbas refuses to speak to him and has urged Trump to sack him. But Palestinians fear that the UK will offer only mild verbal resistance when President Trump unveils his plan – due by January 6. The MP also pressed him on his promise earlier this year to push for an international element in the Israeli army’s inquiry into the use of live fire at the Gaza border. Since the Great Return March protest began on March 30, Israeli forces have killed at least 214 Palestinians and wounded more than 18,000 according to Al Jazeera on 11 Nov 2018. Maria Caulfield (Lewes) (Con): What discussions he has had with his Israeli counterpart on the recent escalation of violence in the region. Alex Cunningham (Stockton North) (Lab): What recent steps he has taken towards establishing a lasting peace between Israel and Palestine. Minister for the Middle East Alistair Burt: The recent upsurge of violence in Gaza reminds all of us of the need to ensure that the Middle East peace process gets moving, because that is the only thing that will make a difference. Both the Foreign Secretary and I have recently seen US envoy Jason Greenblatt, and we will continue all our efforts. Maria Caulfield: The UN General Assembly is scheduled to vote on Thursday on the US-sponsored resolution condemning Hamas for the increasing violence and attacks on civilians and for the worsening situation in Gaza. Will the UK Government be supporting that resolution? Andy Slaughter (Hammersmith) (Lab): Given the Government’s view, which I know the Minister shares, that Israeli settlements are illegal under international law, why do the Government allow the import of goods from those settlements and investment by British companies? Alistair Burt: We allow the import of goods, but the labelling makes that clear, so customers can make their own choice about whether to buy goods from those areas. Bob Blackman (Harrow East) (Con): What assessment has he made of the Hezbollah terror tunnels from Lebanon into Israel that have been discovered? Alistair Burt: The tunnels demonstrate the continual threat to the state of Israel from those who would mean it harm. Again, however, that emphasises the need—I am sure the whole House shares this view—to ensure that there is a resolution of the issues between Israel and its neighbours, so that there can be permanent peace and security for all in the region. Alex Cunningham: Ministers keep telling us that they want to wait and see President Trump’s long-awaited Middle East peace plan. In the meantime, we have seen an escalation of violence, death on the Gaza border, a worsening humanitarian crisis, continued demolition of Palestinian homes and the ending of US support for the United Nations Relief and Works Agency. Is it not time that the UK said very clearly, “You cannot have a two-state solution if you only recognise one state”? Alistair Burt: We have said very clearly that we recognise a two-state solution. We are keen to ensure that when the envoy’s proposals come forward, they get a strong reception, and people can work on them to try to bring a resolution to this long-standing crisis. It is the only thing that will deal with the concerns that he raises. Alex Cunningham (Stockton North) (Lab): Earlier this year, in response to deaths on the Gaza border, the Minister said that the Government would support Israel’s investigation into them and push for an international element to those investigations. How is he getting on with that? The Minister for the Middle East (Alistair Burt): We are still pressing the Israeli authorities in relation to exactly what we said previously. That is the best way to try to find an answer to the tragedy that happened in Gaza.